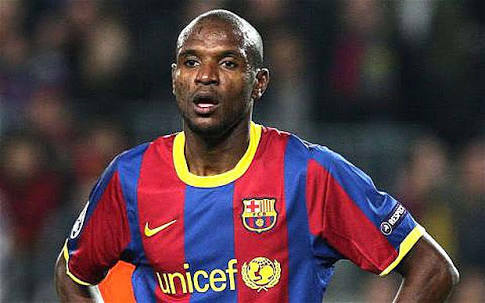 Eric Abidal will replace Robert Fernandez as Barcelona sporting director in the summer, the club have announced. Abidal made almost 200 appearances for Barca in a six-year spell after joining from Lyon in 2007. During his time at the Camp Nou, he was diagnosed with cancer and had a liver transplant in 2012 before leaving for Monaco in 2013. After signing for Monaco, he criticised the way in which the Barca board, at that point led by Sandro Rosell, had overseen his departure. He was subsequently involved in Joan Laporta's presidential election campaign two years ago and would have been named as sporting director had that campaign succeeded. The former France international will now take over the job vacated by Fernandez at the end of this month. "FC Barcelona announces that Robert Fernandez will not extend his contract as the football first team technical secretary which runs out on June 30 of this year," a statement read. "The club would like to thank Robert Fernandez publicly for his commitment and dedication to FC Barcelona over the years and wishes him success in the future. "As such, FC Barcelona also announces that Eric Abidal will take over the role as football first team technical secretary. His official presentation will be on Monday July 18. "The former Barca player returns to the club that he joined in 2007 and where he won four league titles, two Copas del Rey, two Champions Leagues, four Spanish Super Cups, two Super Cups and two World Club Cups in his six seasons as a blaugrana."